Grover Pro Bronze Series triangles were developed to fill a need for lighter sounding triangles that retain a predominance of overtone resonance. 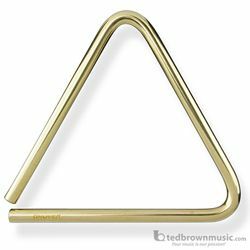 Manufactured using a special cymbal alloy, these "golden" bronze triangles are unique in appearance and are very resonant. Perfect for lighter applications and small ensembles.